Is this productivity all-rounder the ideal printer for your home? 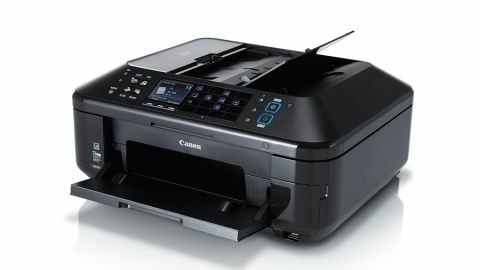 Canon's Pixma range of multifunction inkjets has an enviable reputation for quality, and this business-orientated all-rounder is no exception. Replacing the MX885, it adds AirPrint, Google Cloud Print and Pixma Cloud Link to an already-impressive features set. With a 35-sheet Duplex ADF, builtin fax and Ethernet or Wi-Fi networking, it's clearly designed for the home office. It also has auto Duplex for two-sided printing, and you can print from USB, memory cards or directly from your camera with Pictbridge. There's also a rear tray for photo paper, envelopes or letterheads. Print quality is excellent. Text is clear and well defined, even at small point sizes, and photos are impressively coloured, though they could be a little sharper. Scanning and photocopying are pretty good too, though straight scanner-to-paper copies are a little lifeless. Best scan to your computer and tweak the image if a higher quality is required. It's pretty fast, printing our 20-page test document in around two minutes, 20 seconds; not as fast as an HP Officejet, which can do it in about a minute and a half, but wholly acceptable. If you're sharing a document printer in a small office, you might be better off with a HP Officejet. But for an all-round home office printer that handles photos well, this is ideal.